Curtain rods, traverse rods standard and decorative and how they work. 1 3/8 inch Designer smooth metal curtain poles 36" to 66"
1 3/8 inch Kirsch designer metal telescoping curtain rod poles comes in six new colors. Sizes to fit windows from 36 inches to 180 inches wide. Each set includes plugs for finial and brackets for mounting. Three ring options available and twenty style finial options to complete your decor. 1831-66-120: 1 3/8 inch Designer smooth metal curtain poles 66" to 120"
1831-120-180: 1 3/8 inch Designer smooth metal curtain poles 120" to 180"
Black gold rust iron collection by Altran. Three lengths available, 59 inches, 98 inches and 118 inches, in three colors, black, black gold, black rust. The 94005 series Kirsch Architrac system is used for baton draw cubicle, pinch pleat and Ripplefold draperies. This system measures 3/4" wide by 1" high and is made of .050 extruded aluminum with an white finish. This track can be bent or curved. Wide assortment of parts to accommodate your drapery design. Project 2 3/4 to 4 1/4 inches inside and 6 1/4 to 8 1/2 inches outside rod. White finish. A double curtain rod combination for a traverse rod layered wide pocket topper valance treatment. Clearance 2 to 3 1/2 inches inner and 6 to 8 1/4 inches outer. Valance pocket size required 3 to 3 1/2 inches. Made of heavy .0165 gauge steel. Laced with heavy duty braided cord. Standard cord length is 7 feet on all Graber traverse rods. Drapery double rods. Graber double bracket curtain rods. Includes mounting hardware. 2 1/2" dauphine curtain rods 66-156"
4 to 6 inch projection and clearance of 3 1/2 5 1/2". White finish. Rod pocket size 3 to 3 1/2 inches. A commitment to quality. Adjustable curtain rods. Note: If ordering more than one rod, call for corrected shipping cost. Our commitment to quality is steeped in tradition. Whether it's inspiration you seek or innovation you crave, energize your creative spirit with the drapery hardware collection by Graber. 2 PVC Supports (3 pieces). 4-721-1: 2 1/2" dauphine flat valance curtain rod 18-28"
4-722-1: 2 1/2" dauphine curtain rods 28-48"
Key tassel 5 1/2 inch with a 3 inch loop from the Perle collection. Fiber content is Viscose/Rayon. Set with 1" pulley for better performance. Custom sized to your specifications. Can use for corner curtain rod installations as two rods butted in corner with one way draws on each. Base price for first 3 feet. Set Includes assembled rod, 94270H wall or 94130 ceiling brackets and 9923 cord tension pulley; longer brackets can be ordered separately. Truck shipping not included on rods over 104" long. Inches --select-- 0 1" 2" 3" 4" 5" 6" 7" 8" 9" 10" 11" 12"
54803: Bay curtain rod swivel socket 2"
4 1/2" diameter Traditional square holdback medalliom coordinate with designer metal curtain rod poles and traverse rods. Comes with post arm with clearance of 2 1/2" or 5" or 7". drapery hardware from Kirsch, Orion, Design Elements and Altran. All products are supported with replacement or extra parts. Modern or Contemporary curtain rods use metal and glass to give you the style your are looking for in a modern setting. Curtain rods are available in 3/4", 1", 1 1/8" and 1 3/8" diameters up to 270" in length. Wider widths are available by using connectors designed for each brand. Curtain rings, brackets and finials are available in coordinating finishes. Most items ship in one to five days. Single, double and even bay windows can be covered with the brackets and corner elbows available. Wrought Iron curtain rods from some of the top companies available for quick shipping in a varity of lengths and diameters. TMS Inc. offers Natural Bamboo Rods for Curtains with a two inch diameter. Four foot, six foot and eight foot lengths are available. These are natures creation and will not match in color as each has a distinct design provided by mother nature. All the accessories are made from resins that coordinate with the bamboo look and color. This includes brackets, rings and finials. Put a tropical touch in your home with these bamboo poles and the wide assortment of pinch pleated drapes available in tropical patterns. Simple holdback for 1 1/2 inch diameter indoor or outdoor curtain rod. Available in two colors in stock, ready to ship. It can be used indoor or outdoor. Use on those windows that face patio or pool area, or use inside on any window. Charleston collection by Design Elements. Twist rings for Valencia 1" curtain rod pole. Some colors are more than base price. Valencia Collection offers stock and custom colors. Stock Colors: Black, Antique Gold, Rust. Antique curtain rods for tab top curtains, eyelet curtains or pinch pleat draperies. 4 foot Smooth 1 inch metal curtain rod.. Wrought iron curtain rod look. Some colors are more than base price. Stocked colors ship in 1-2 business days, custom colors ship is 5 business days. Stock Colors: Black, Antique Gold, Rust. The Charleston Indoor Collection is a new 1 1/2" iron, resin and steel decorative hardware line that is available in custom colors and two stock finishes, black and dark brown. Matching brackets, rings and finials are available to finish your custom design. Rods can be cut to your exact size at no additional charge. Note: Custom colors and cut rods can not be returned. Standard wood curtain rod brackets 2 1/2 inch projection for 2 1/4 inch wooden curtain rod, These wooden curtain rod brackets have a 3 1/2 inch return. Over all size is 5 inches high by 1 inch wide by 6 inches deep. Wood curtain rod brackets for the Renaissance collection. Super heavy duty window drapery rods . White finish. A commitment to quality. Projects 2 to 3 1/4,inner, and 5 to 6 1/2 inch on outer, clearance 1 1/4 to 2 1/2 innner, 4 1/2 to 5 3/4 on outer traverse rod. Includes cord tension pulley. Returns 5 3/4 to 7 inches. Graber super heavy duty features include a universal front loading end bracket, metal adjustable and reversible master carriers ball bearing end pulleys, a spring loaded side gate for adding or removing slides, molded, canted slides, can be converted to one way draw, scored center support base for easy mounting on narrow casings, universal cam lock stirrup, braided polyester cord, and angled tip on overlap arm. Drapery double rods. 1 3/8 inch Kirsch designer metal telescoping traverse rod poles comes in six new colors. Sizes to fit windows from 38 inches to 180 inches wide. Each set includes plugs for finial and brackets for mounting. Ring slides included and twenty style finial options to complete your decor. The Metropolitan Collection gives you the opportunity to dress your window draperies with an elegant modern look and feel. This 1 1/8 inch curtain rod comes in brushed nickel and just added, black, finishes. Crafted using a combination of steel, zinc-alloy and acrylic materials to give you a sleek, contemporary look. A wide selection selection of finials, brackets and components allow you to cumtomize your windows with a quality, well priced product delivered in a short time frame. Shipping time is only one to two business days on the entire line. Rods come in 4, 6 and 8 foot lengths that can be cut to your exact size. For wide windows, a connector screw is available to join two or more rods together with the help of a support bracket. C-rings and bypass brackets are available to allow your curtains to slide by the support brackets. For 3" wood curtain rods. Kirsch wood trend wood bracket, 6 inch returns. 8 7/8" front to back x 1 1/8" thick x 4 15/16" base height, 4 1/2" clearance behind pole. 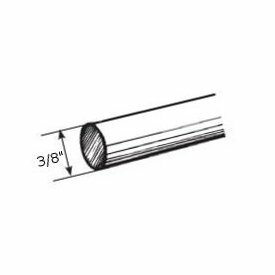 Select wood curtain rod pole 1 3/8" diameter, 4 feet long. Drapery hardware available in 4,6,8 and 12 foot lengths. Ten colors to select from plus unfinished. Base Price is for unfinished rods. Colors will show price in the cart. Note: 12' rods have to be shipped by truck.